Christmas is coming! Have you started making your to-do list? How about all of those homemade Christmas gifts you have been wanting to create? Today I have the most adorable Creative Gift Ideas for Christmas that your friends, co-workers, teachers, neighbors – really everyone on your list will love! First, a little backstory on these Hot Cocoa Kits. 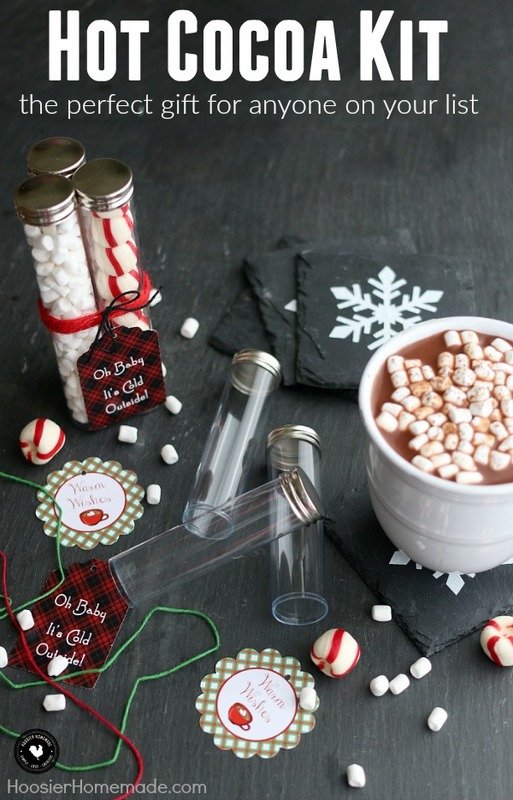 Last year, I posted this idea in our 100 Days of Homemade Holiday Inspiration. I loved the idea and knew it would be fun to give as Christmas gifts. But…then it happened…it went crazy on Pinterest and Facebook. Which first of all is a great thing, BUT everyone wanted to know immediately where to find the tubes to make the kits. On the original post, she talked about the tubes but never said where she found them. So we hunted around and found them this year. You can find the tubes on Amazon. Next you will need to get ingredients to fill the bottles. Follow us on Pinterest for more GREAT projects and recipes! 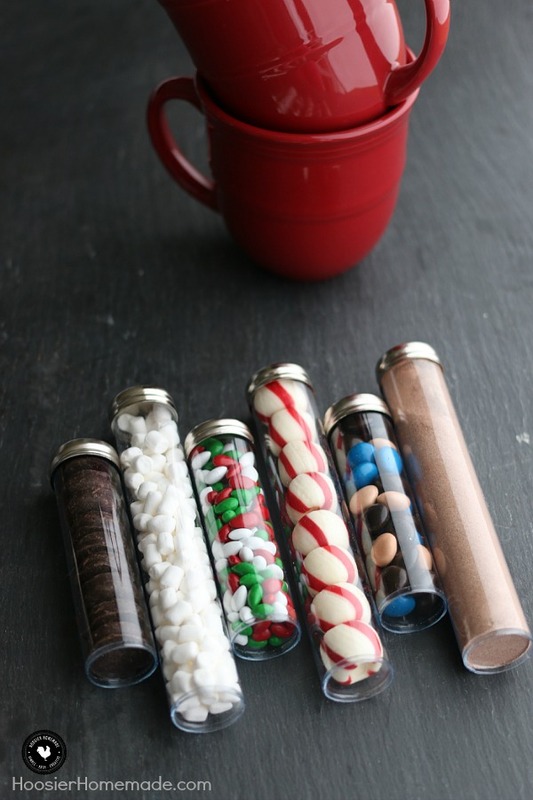 Hi, if you do not intend on making your own hot cocoa recipe, how many packets would you think to put in the tubes? Thanks, Skylar. What a wonderful idea! Thank you for sharing! Hi Leah, I put 4 together, the bottles I purchased come 2 to a package. You can use as many as you like. Although I love your idea, after going to HobbyLobby and looking for the composition of the bottles, there was no mention of the type of plastic they were made from. It is not safe to assume that all plastic is food grade. So I would caution anyone putting foodstuff in un-documented containers. 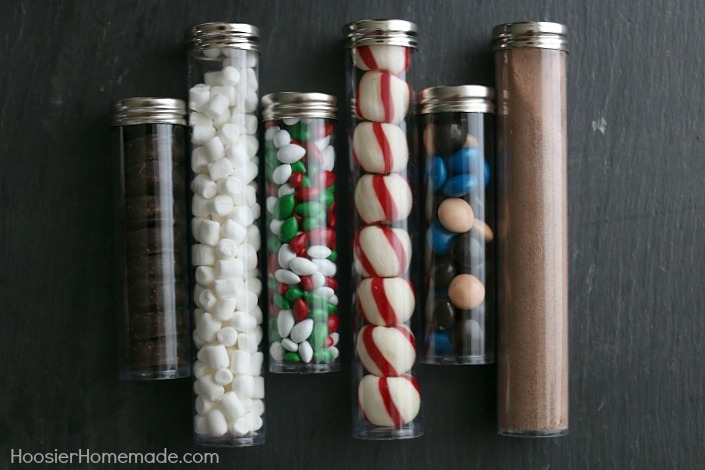 When we make gifts, we should make sure the containers are food safe. This is the same as using pretty plates found at yard sales, DECORATIVE plates from places like the dollar store are marked with a paper label saying saying NOT to be used with food, but these paper labels are soon washed away and the dishes now have no warnings. My pet peeve is that these should be marked with a permanent label. I have some old spice jars around here somewhere…. they would work great for this too! Thanks so much Gail! They are definitely fun to make! Liz, if anyone is concerned about the food in the bottle, just put the cocoa in a plastic zip lock bag and then in the bottle, the cookies too. Really cute idea! I wish I had this idea when my boys were young and I needed little gifts for teachers. Maybe I’ll have my grandson help me make them and give to his preschool teachers. I am wondering if there are any instructions that go with the mix? Amount of cocoa and water/milk to use? 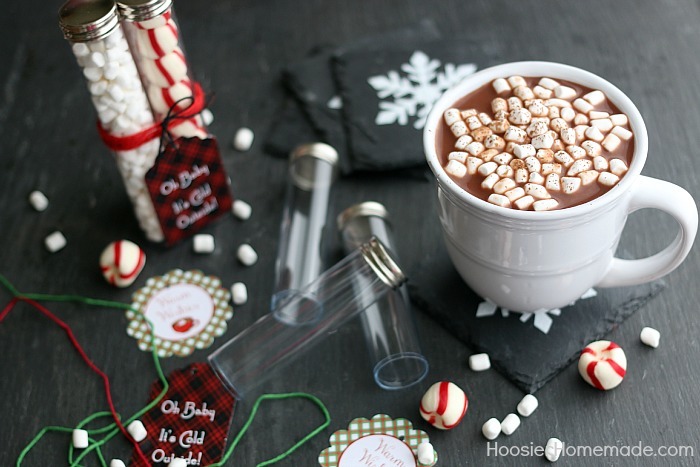 You can use 1 tablespoon hot cocoa mix to 1 cup of hot milk. Mason jars would be EXCELLENT for this idea. Thanks so much for the great idea. We have the 12 days of Christmas at work and each day we give something small to our teams co workers and I have been looking high and low for different things than what I gave last year. This will be a great addition. Where do you put the oreo cookies? Hi Karleigh, do you mean what tube or where do you use them? I like them sprinkled on top of my cocoa. Hey, Liz! Thank you so much for this wonderful craft, I found it on Pinterest. Could you please tell me the height/diameter of the tubes? I would like to try to find them online in bulk… Did you mean you paid 5 dollars for each tube? Hi Marila, no the tubes were $1 each at the store. I have searched every where and talked to lots of online companies this week. You can find them online, but they are over $2 each. Question on the bottles as I think this is a great idea. Are they food grade or just craft grade as there is a difference In what you can use them for. Thanks for hunting them down as that is the challenging part finding all the components. Hi Holly, the bottles are craft grade. I would not be concerned about them not being food grade unless you are going to be putting liquid or food that would be stored for a long time in them. That is my opinion though, as I’m not an expert in the plastic field. Working in the food industry I’d just make sure they (the bottles and lids) are washed, rinsed and dried good before putting items in them. Just in case there is any residue left inside them from being made. Craft bottles are not food safe. I love the idea but unless the bottle is specifically marketed as safe for food, I wouldn’t give them to anyone. Hi there, yes we are aware of that. We sterilized the bottles first in the dishwasher. Also, none of the food in the bottles are liquid and will be used rather quickly. This is such a great idea. I absolutely love it and plan to make these as teacher gifts for Christmas. Love it! Thanks for stopping by Kelli! 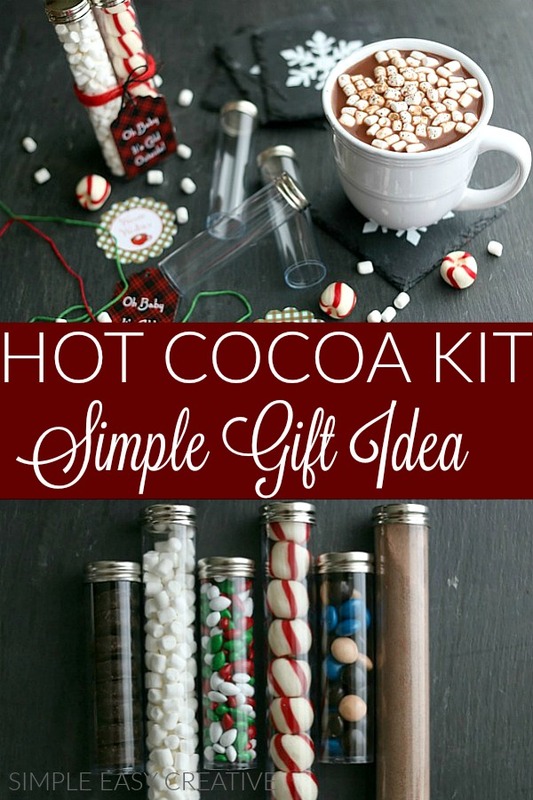 I’m so excited you like the Hot Cocoa Kit!